About three weeks ago I found myself sitting in a beautiful studio apartment, smelling like moussaka (which I’d been cooking since 12am that morning), and sharing a cup of tea with a very nice chap called Nat, who just happens to be a professional food photographer. This sounds a lot more random than it actually was. Thanks to my catering job the powers-that-be had put Nat and I in touch, and so after one of said jobs we got together for a chat about food, photography and life; during the course of which, and to my absolute delight, Nat offered to do some work with me, teach me a little more about how to style food and how a professional food photographer works. Of course I said yes, then practically skipped all the way home (in fact, I think I did skip down Turnham Green Terrace, which elicited quite a few strange looks). We arranged to get together the following week to shoot a slightly special dish of mine, one that I’ve been developing for some time and thus needed an extra special touch: Pan-Fried Scallops on a Polenta Disc, Topped with a Crispy Strip of Pancetta and Pea Shoots, Served with Pureed Minted Pea & Tomato Chutney; or it’s slightly shorter name: Not Fish & Chips. Fish and chips are one of those real British comfort food dishes. When I was younger it was such a treat to have, a once a month thing; the only downside was that by the time we got it home it was slightly cold and soggy, so Momma Lee would pop it all into the oven for a few minutes to warm through and crisp up. My main issue with a fishie is that it’s greasy and huge, and so by the time you’re about halfway through wolfing it down you’re already full, ready to collapse into a food coma, and feeling as if you’ve smeared grease all over your face (no? Just me? Okay then…). What I really wanted to do with this dish, then, was to create a smaller bite, an homage to fish and chips (replacing the potatoes with polenta and the traditional cod with scallops), but make it a bit more romantic than a greasy slab on your plate; it has all of the components of fish and chips, just maybe a little fancier than you’re used to. And scallops are such a treat, so this is a real special occasion dish. The first time I made this was actually for David’s leaving/birthday dinner the night before he left London, so, as you can imagine, it’s a recipe I hold dear as it was one I really developed especially for him. When I made it that night the flavours were there but the finesse wasn’t: I had issues with the purees (no immersion blender) and the styling was, er, not great. However, this time, under Nat’s supervision and with his fantastic photography, we created a really beautiful plate – I even used a pair of tweezers to place the pea shoots on top of the pancetta! That’s a pretty big deal for me! The chutney (adapted from BBC Good Food) takes a little time, so I recommend making it in advance and then warming it through when you’re ready to plate. 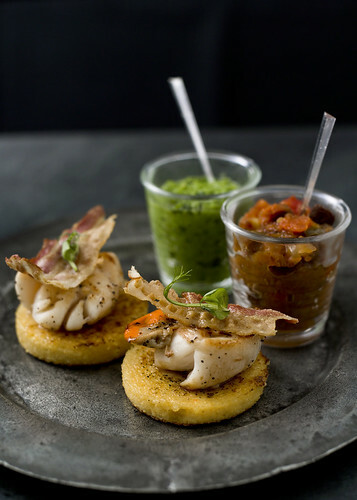 The polenta can also be made ahead, as it needs some time to cool & set; when you’re ready to plate you can cut out the discs and pan-fry with the scallops and pancetta just before serving. Because I’ve used frozen peas they’re very quick and easy to do, so you can either make the puree ahead of time and warm through before serving, or make it when you’re ready to plate. It was such a pleasure to work with Nat who is calm, encouraging and full of energy; and it took so much more time than I’d anticipated! A real process, but definitely a great learning experience, one that shall be repeated soon as we’ll be getting together to create some more of my slightly special dishes that I’ve been holding back on. So, until then, check out Nat’s other work in his gorgeous portfolio and enjoy my dish: it’s a good ‘un. 1. 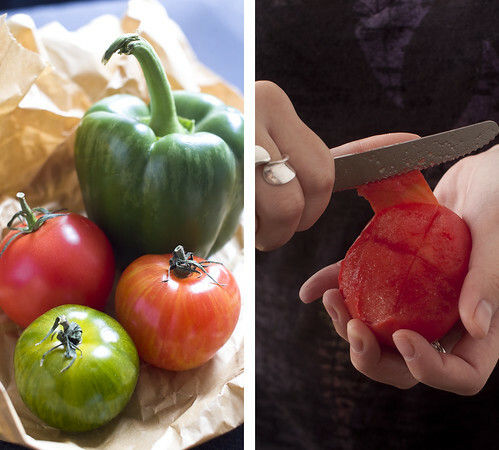 Wash, de-stalk and cut a cross into the bottom of the tomatoes. Plunge them into boiling water for a few minutes and then remove – this will help you to peel the skin more easily. De-seed then chop into small-ish pieces. 2. Combine all of the chutney ingredients in a small saucepan and bring to the boil, stirring with a wooden spoon to make sure the sugar is dissolved. Boil, uncovered, for around 15-20 mins or so, until the fruit is tender and thickened. Set aside to cool, then, using your immersion blender (if you don’t have one a blender is fine!) blend about half the mixture and mix the other half in for texture. NB. With the amount I’ve given you here you’ll have plenty of chutney leftover (goes awesomely with cheese!). 3. For the polenta, bring the water to the boil then add the stock cube and stir to dissolve. Pour the polenta into the pot in a steady stream, simultaneously whisking. When combined, cook for about 3-5 mins, stirring with a wooden spoon, until thickened – I tend to judge this by eye, you may need a little more water if it’s too thick, or a little more polenta if too thin. Polenta has a tendency to bubble somewhat volcanically, so stand back: more than once I’ve been burnt by a popping polenta bubble! 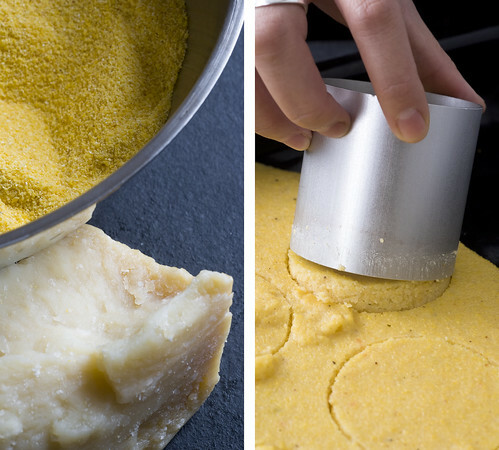 Add a dash or so of milk – this gives the polenta an extra creaminess – then stir in the parmigiano regiano and season to taste. Pour onto a flat surface (a baking tray is good) and leave to cool and set. When set, cut rounds from it using a cookie cutter, food ring, or anything else round with an edge – a glass rim is also good! 4. For the pea puree: place the frozen peas and mint into a saucepan, add a small amount of water (you really don’t need a whole lot, just enough to provide a little moisture for the puree) and bring to the boil. Take off the heat and blend using your immersion blender (or regular blender). Season to taste and set aside. 5. Season the scallops with salt and freshly ground pepper. When you’re ready to serve: put about 1-2 tbsps olive oil in a heavy-bottomed saucepan and allow to heat up. Using a spatula, carefully place the polenta discs into the oil and fry until crispy (about 1-2 mins on each side). Polenta spits, so stand well back or use a splatter cover. 6. 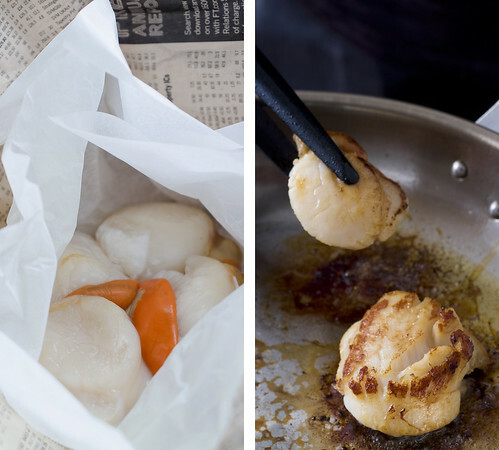 Follow this up with the scallops – they don’t need too long on each side, up to a minute or so – gently press them to check if they’re done – they’ll have a firmness with a little spring in them. If you leave them undisturbed in the pan their natural sugars will come out and caramelise on the surface. Be careful when turning them over (use a pair of tongs) as they stick and may rip! Finally pan fry your halved strip of pancetta until crispy and then drain on a couple of pieces of kitchen towel. 7. Plate as follows: polenta disc topped with scallop, topped with pancetta half, and pea shoots. Serve alongside pea puree and tomato chutney. Cosy up with your loved one and enjoy a romantic start to your evening! Oh, and in other news, I made it through to Project Food Blog round 8! Thank you all so much for your votes – thrilled to still be in it and be the sole representative for the UK/Europe! So keep an eye out for entry 8, coming later this week. It’s a good ‘un, I promise. Until then, peace and love. Love seeing a guest photographer on here! What a nice way to showcase both his and your incredible talents. I love every aspect of this recipe, but that pea puree is really striking. I can see how that can bring the whole dish together. Looks wonderful! Oh. Wow. You, lady, will be the death of me. Or the death of my waistline, anyway. I’m already stuffing my face with everything within reach, due to it being exam time round these ‘ere parts – and then you come up with recipes and photographs like those ones up there *points*. Jax, you’re stylin’ and so is your food! Beautiful presentation with equally outstanding photography…and the recipe ain’t too shabby. Good for you! Beautiful! Food is such a tough subject too. Very well done and so original and delicious looking! Nat’s work is beautiful…and of course your work is too! I’m consistently blown away by the content and the photography you share with us! These not “fish and chips” look so scrumptious, my dear. I’m full from my Thanksgiving feast, but I still think I would have a hard time passing this up if you handed me a plate! Thank you for sharing. I hope you have a great weekend!